Young Emily leads several girls into a maze and they emerge in another world whose kindly Empress is being drained of power by self-seeking and unscrupulous villains. The girls offer to help and have breath-taking adventures as they journey across the world to the Highest Mountain, where people of all races share their vision of a peaceful and happier world. On the way the girls are challenged to the utmost of their endurance. They have to learn and grow in order to survive. They are helped by dolphins, a water spirit, an angel in human form and by a wise woman counsels them until they release the hidden worries and fears that weaken and divide them. The girls are transformed by their experiences and on their return, teach the Empress to accept her share of responsibility. But that isn’t the end of the story – the baddies are still out there! Emily and the Angels is part one of a trilogy . . .
(Secret: grown-ups enjoy this book too). 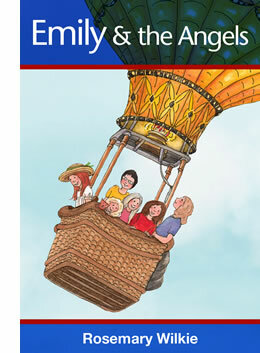 You can order Emily and the Angels (ISBN 0-9533936-0-7) online or from any good bookshop. This earlier cover has a picture of the Empress’ balloon. In February 2000 pupils of Beacon Community College in Crowborough, East Sussex, voted Emily and the Angels best book with 211 votes. Rosemary Wilkie was voted best author with 195 votes. Roald Dahl came second and Jacqueline Wilson third.